It is of vital importance to be able to differentiate spurious claims from legitimate ones through appropriate investigation techniques and complete and thorough documentation. Low-speed collisions are difficult to analyze because there is often little or no physical evidence and statements taken from drivers, passengers and witnesses lack depth and detail. In this book, you will learn to take timely photographs properly and interpret them for revealing clues. You will learn how to conduct effective interviews, get the information you need, and detect when someone is being untruthful or evasive. You will know how biomechanics and occupant kinematics affect your case. 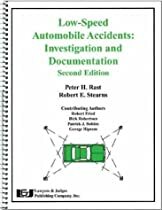 In the end, you will be better equipped to investigate and document low-speed automobile collisions, reach the appropriate conclusion and arrive at a fair and just disposition of your case.